David is a partner in Arthur Cox in the Litigation & Dispute Resolution Department. 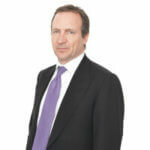 He advises on a wide range of commercial disputes including insurance/policyholder disputes, intellectual property litigation, professional indemnity and financial services litigation. David has extensive experience in litigating commercial disputes in the Commercial Court in Ireland for both plaintiffs and defendants. David is a seasoned professional and expert in his field. David graduated from University College Dublin in 1980 having completed a Batchelor of Civil Law, he then went on to qualify as a solicitor in 1983.